Is Bryce Harper's upcoming free agency behind the Nationals' pursuit of Sale and McCutchen? Okay, now this is some quality hot stove cooking. USA Today reports that the Nationals are preparing for life after Bryce Harper. 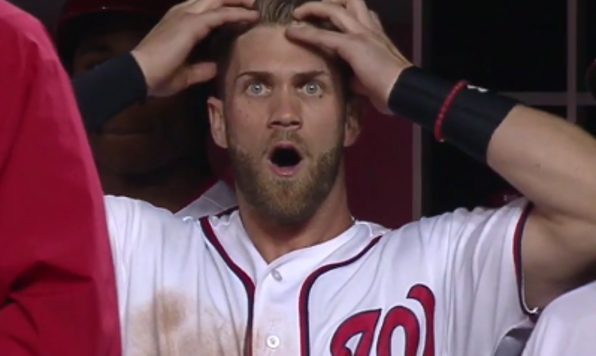 According to Bob Nightengale, Harper is seeking the biggest contract in the history of the sport. The Nationals, who had begun preliminary negotiations this year to retain Harper beyond 2018, believe the chasm in their talks now have become too great to overcome. While no specific dollar amount has been broached by high-powered agent Scott Boras, the executive says Harper is seeking a deal more than 10 years in length, believing it would exceed $400 million. $400 million! Now, granted, the value of money isn’t constant, etc. But even adjusted for inflation, Alex Rodriguez’s original $252 million deal from 2000 would only be worth $353,749,756.10 today, according to the first inflation calculator listed in the Google search results. And when you’re dealing with contract lengths of a decade or longer, time-value of money really does come into play. But that’s not important, what’s important is this: $400 million! That this report is coming out now is interesting, and perhaps speaks to a bit of posturing on the side of the Nationals. Scott Boras isn’t afraid to negotiate through the media, and this could be a bit of a preemptive strike for Washington’s front office. Except, if you were in charge of a team that knew you were going to lose the face of your franchise after two seasons, how would you react? Would you maybe decide to screw long-term prudence and just try to win while you still had your star? Because that might be exactly what the Nationals are doing, as they’re reportedly hot after two of the biggest names on the trade market: White Sox ace Chris Sale and Pirates center fielder Andrew McCutchen. Reports have swirled all week about the Nationals chasing both players, and those reports are true. The Nationals have, indeed, discussed both all-stars with their respective teams. They have not, however, indicated a sudden willingness to part with their best prospects to get them. If Washington had, it would almost already have one or both players. The #Nats are actually trying to trade for Chris Sale AND Andrew McCutchen and believe they have the prospects to pull off both trades. Nats are said to stepping for Sale. Meeting this aft. Red Sox are involved, and others, too. So, with this much smoke, there’s definitely fire. And at the same time as the Harper negotiation leak, these moves almost have to be intertwined. It’s certainly impossible to speculate from the outside, but the timing is on point. It really does look as though the Nationals are staring down a future without Bryce Harper after 2018, and want to build a team to compete with the best of the NL (that is, the Cubs and Dodgers) for the next two seasons. From there, who knows? They’ll have a bit of cap room, and indeed wouldn’t be adding any long-term salary even if they managed to acquire both Sale and McCutchen. Sale has an option for 2019, while McCutchen would be a member of the same free agent class as Bryce Harper. While adding those two players would likely improve the team in the short-term while maintaining their long-term financial flexibility, the talent cost would likely be incredibly high. With those factors, plus the two Wild Card slots, they should be at least solidly in playoff range for the next two seasons. And once you reach the playoffs, anything can happen. That said, for the game, things are always more exciting when a team decides it’s time to go all-in, regardless of long-term ramifications. The Nationals might be doing just that.